I do not yet have a colony, but I am learning about different ways to set up formicariums and outworlds (as well as ant care) in preparation for next year when I will try to catch a Black Carpenter Ant queen. I want to make my first formicarium by carving some firebrick, but I want it to last a while so I do not have to carve another one and try to get my colony to move for a little while. So basically, I would cut the cork board to fit the chambers that the ants do not need to use yet (excess space) and then put the acrylic/glass/similar over the chambers to finish building the formicarium. If it works like I'm thinking, the ants would then chew out the chambers as they need more space. There are a few things I'm unsure about, though. 1. Would the cork board mold because of nest humidity? Could this be prevented by placing the hydration chamber on the opposite side away from the cork board? 2. Would the ants dig into the board immediately and use the chambers they uncover for trash, dirtying their nest and potentially opening them up to sickness? 3. Would a better alternative be to put some type of soil or sand in the chambers instead and let them excavate as needed, rather than cork board? What soil/sand should I use, and will freezing the soil/sand before putting it with them help prevent the spread of any pathogens or parasites that might come in with the substance? If so, for how long? So, is this a good idea? Would it be better to just make a smaller formicarium and build a larger one when the time comes? Sorry for asking so many questions, I just really want to get it right the first time. First of all, I don't think there's any need to think of formicarium ideas yet. Once you catch your queen, it will still take probably a year before they'll need a formicarium. The cork might not mold, but that's definitely a risk. The ants would probably just dig into it and make their own nest inside of the cork. Overall I think instead of filling it up you should just put some sort of plug in which you can pull out later. Or you can make multiple nests inside of one outworld and then open up the other nests once they need more space. For your first question, it seems possible that the cork board could mold..however I don’t have much experience using cork as a substrate or digging media. What I would recommend you do to find that out is to take a smal piece of the cork, dampen it and place it inside of a container somewhere dark And warm for a few days to a week. Maybe even add something in that you think WILL mold that touches the end of the cork piece to see if the mold spreads onto the cork. That should help you to see at least if the cork is susceptible to molding. Honestly I don’t think I could accurately say for sure when the ants may choose to dig. There are likely a lot of factors that could either cause them to or not. If they are comfortable with the amount of space you’ve given them then they may not dig it out for a while. Two similar sized colonies might even use the nest differently depending on the current needs of the colony, whether that’s to get as far away from the giant hand that put them in there as possible (fear/protection), temp, humidity, lighting, overall colony size, specific species nesting habits, among other things. I wouldn’t say you couldn’t use either sand or soil,or some combination of the two, however what I’ve noticed when watching my camponotus in their nest is how they tediously shred the substrate to use as nesting material to kinda form walls around where the colony is nesting. In one of my Camponotus chromaiodes nests I literally used damp paper towels rolled up in an uncle Milton ant farm. Maybe I can post a pic of what they did so you can get the idea of what I mean. When I see this craftsmanship it makes me feel like they are comfortable enough at least to work on their new home. I’d also recommend looking into a few other media choices that may be of some use to you. Something as simple as cotton balls that have been loosened and pulled apart slightly can make a clean substrate that holds humidity well and that can be manipulated by the ants to cozy up their nesting area. Another possible alternative is coconut fiber instead of soil. It’s not exactly wood but it’s still plant matter and relatively close to crumbled up decaying wood in consistency. Most pet stores should have this, either loose in a bag or in dried and compressed blocks. Good thing is that I don’t think you have to bake or pre-clean this media. Yet another consideration could be Camponotus’ naturally chosen nesting media - Decaying/Dead wood. Dead wood that has been dried, baked, broken/mulched down and then re-wetted can create a soil like substrate that, if pressed and held together within the formicarium, could simulate a rotting log. This should be a media that the carpenter ants could dig into and manipulate whenever they chose to. Unfortunately, freezing IS NOT a method to kill potential pathogens or parasites. If you want to use soils or sands from outdoors you can bake the soil/sand in the oven on a baking sheet/aluminum foil to sanitize it. If done properly I think this should leave you with a ‘cleaner’ soil. Freezing only slows down organisms living within the dirt. If you do not have the queen setting around in a test tube set up waiting for eggs, brood, or more workers yet then yes you may need to be a little patient to completely found a colony. You also could find a larger wild colony inside rotting logs. Sometimes finding them in the cold seasons isn’t as bad as I had thought because in winter a big colony can’t all run and scramble as soon as you open the log and find the nest, making it marginally easier to collect all or most of the ants and brood and find the queen. You could also add any wild brood you manage to find outside to your queen to boost her worker population. One potential problem with putting a lone queen (newly caught after nuptial flight) into a large formicarium is that she will make her founding chamber somewhere. If she makes it somewhere difficult for you to feed her, provide water, or even watch her. In a test tube set up or some other smaller container you can closely monitor her, notice eggs after they’re laid, and feed her if necessary. It’s really up to you and your preference for if you want to raise the founding queen into a colony in a smaller formicarium, find a larger colony, or raise the queen into a colony all from within your planned formicarium. In my honest opinion, if you catch only a queen, that has no workers or brood at all, I would keep her in a test tube set up or something similar(I have two colonies(one 3 workers and another 5 I think) inside light bulb set ups.They would just need rehydrated a lot more often than a test tube set up would since test tube set ups contain a supply of water.) I do want to say that the carved out brick formicarium sounds like it could be a really good idea, seems kinda similar to AC pumice stone ant farms right? No worries I understand wanting to do things correctly and needing information in order to make an more educated decision. If any others come up feel free to ask! Oh and if you find that the cork does indeed mold...don’t use it. You’d save yourself a lot of trouble. The dead wood method I mentioned above sounds like it could potentially accomplish the same idea you had with the cork, allowing the ants to continue growing in number and excavate more tunnels as the need arises. I’ve actually even made styrofoam nests for at least two of my current colonies. Styrofoam is easy to cut and shape with a razor blade. That added with cotton ball flooring (to help retain water and humidity) actually makes for a surprising result. Maybe I can post a pic of them just to give a general idea of what I mean. The two styrofoam structures house Myrmica sp and Camponotus chromaiodes colonies. About your concern with the ant’s trash, they are actually extraordinarily tidey for an insect’s trash pile...If you choose to supply them with a media then they will bury pieces of trash or unwanted food. I think I’ve seen mine pack cotton onto left overs before. Founding colonies really don’t make too much of a mess; just remove their uneaten food after they’ve placed it far from their main area or at least after the ants are no longer feeding from it. 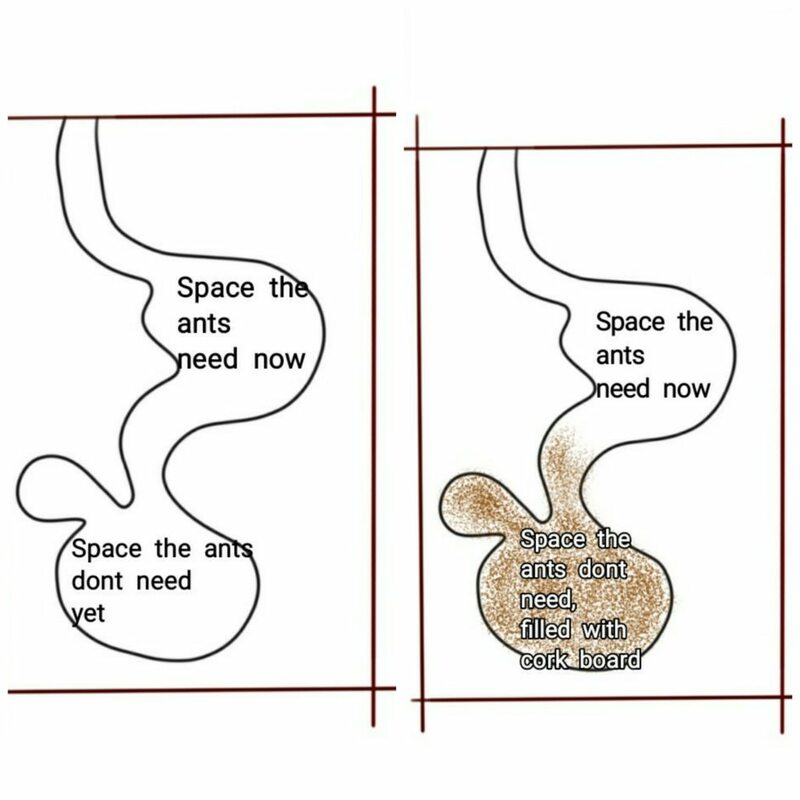 If you are planning on making an outworld for the ants after you’ve attained a decent sized colony, find a way that would allow you to easily remove and clean up the trash pile after it has accumulated enough waste. Hope any of this info is helpful!